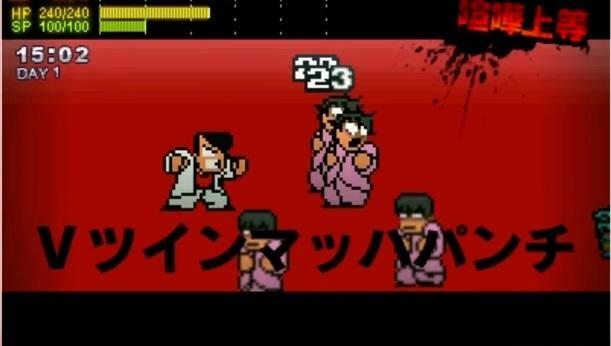 River City Ransom SP continues to dazzle as a re-envisioning of the NES classic, and the latest trailer highlights the combat depth and animation that developer Arc System Works is pouring into the franchise's latest entry. No longer are Alex and Ryan, the characters' American names, limited to a handful of kick and punch techniques. It's true that the original houses more fighting options than the average NES beat 'em up, but this new SP version adopts a brand new RPG system that exponentially increases the maneuvers they can learn. Counter-attacks, super attacks, combo attacks, throw techniques. The team behind this game obviously loves the original and has piled up more of what everyone wants on top of what already exists: the ability to bring the pain to street gangs and make them scream BARF! The graphics have also been given a much needed overhaul. Arc System Works retains the iconic sprites from the days of the NES, but new combat techniques also require new animations, and the team has happily responded with new animation frames. The backdrops also have been redesigned to better reflect different kinds of Japanese neighborhoods. To cap it all off, the trailer announces a new Vs Mode, a new addition to the franchise. River City Ransom SP has been confirmed for a release in Japan on April 28 for the Nintendo 3DS. I'm one of the many hoping that someone steps in to localize it for North American audiences.